* Data Shield: This new Protection prevents malware from accessing your personal data. In case a new malware can surpass all protection layers and infiltrate into your PC, Data Shield will avoid any theft or encryption of the important thing: your personal data. * Parental Control: Keep an eye on the web sites your kids are visiting and protect them from inappropriate content by blocking access to any of 59 different categories. Have a quick view of your childrenâ€™s activity in a dashboard filtered by date, website or category. * Rescue Boot: This new feature is extremely useful in case of emergency situations caused by malware infections. 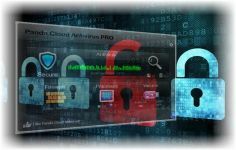 Once created you will be able to boot from a USB or from a rescue option in your PC and remove any virus that locks your system thanks to Panda Cloud Cleaner technology. * Access Control: Access to Panda Cloud Antivirus settings can be protected by a password from unauthorized people. * Safe Mode: Users will be able to install Panda Cloud Antivirus 2.2 and scan their PC against malware threats in Safe Mode.